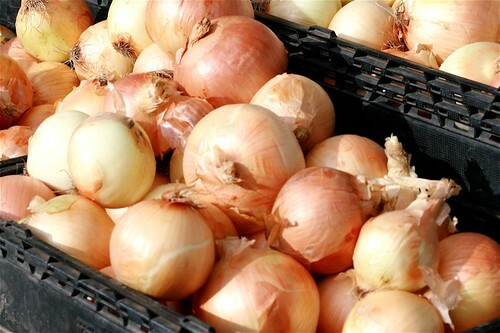 Here's a great side dish to accompany grilled or roasted tri-tip - baked onions. There are a couple of ways to make this dish - one in the oven ahead of grilling the tri-tips on the Weber BBQ, alongside the tri-tips if you roast them in the oven, or ahead of time by cooking the onions in the coals of the BBQ fire. It couldn't be simpler - just takes a bit of planning and a bit of time - but it can overlap with cooking the tri-tips if you first start by getting the onions going. I like to use just plain yellow onions - available everywhere. A rule of thumb might be 1 medium onion per person - but we really like onions so we usually double up the recipe and keep any left over to warm up along with the left over tri-tip later in the week. To roast the onions in the oven, begin by pre-heating the oven to 425º F. Then, take a baking sheet or glass baking dish with aluminum foil (to ease the cleanup chores) and simply place the onions on the sheet or into the dish. Put them into the oven and wait - about an hour or so. Test to see if they're done with a knife which should go in easily and come out cleanly. Remove them from the oven and let them cool down so that you can handle them. To serve, use a knife to cut off the top and, optionally, drop a pat of butter into the onion - seasoning with salt and pepper. For an alternative technique - cooking the onions in the coals of the BBQ - see this Weber video about "Melted Onions". What's for Dinner this Christmas Eve?